On account of having recently run a marathon, acquired a full-time job, and just being generally bad at managing my day-to-day distractions, I have not posted anything in aaaages. Nor have I done much along the lines of crafting. But here, a peace offering! 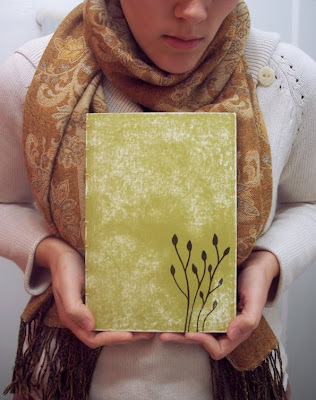 Enjoy this delightful image of a delightful hand-bound sketchbook I made a few weeks ago. If all goes well over the next few weeks, I'll have even more delightful things to showcase at this years Streeterville Artisan Market. Fingers crossed for productivity.